Charlotte Wesley Holloman came from a musical family. Her father, Charles Harris Wesley (1891-1987) was a noted historian, educator, author, musician and minister in the African Methodist Episcopal Church. He developed an exceptional voice, which led him to sing with Roland Hayes and the Fisk Jubilee Singers as a student. In addition, he received a Master’s degree in history and economics from the graduate school at Yale University before beginning a teaching career at Howard University. Subsequently, he received his Ph.D. from Harvard University, making him one of the first African Americans to do so in History. Her mother, Louise Johnson, sang in the Howard University Choir as a student. Her late sister, Louise, was a pianist. Mrs. Holloman studied piano at Howard University with Hazel Harrison. She graduated with a Bachelor’s degree in Piano, then obtained a Master’s degree in voice at the suggestion of her undergraduate voice teacher, Todd Duncan. 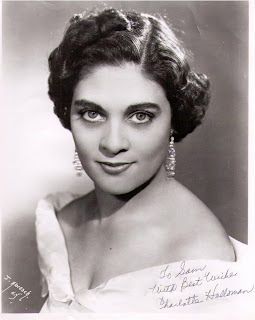 After her concert debut at Town Hall in 1954, she studied and performed in opera in Europe for many years. My conversation with Mrs. Holloman took place at her home in Washington., DC on August 18, 2007. SP: Tell me about your career? CH: I did not do a great deal of singing throughout the country until I made my concert debut at Town Hall in 1954. Apparently, it was quite an occasion for the newspapers and magazines. They were extremely taken by my concert, and I got some marvelous reviews. SP: How did you become interested in music? Was it a part of your family? CH: From the time I was able to touch the piano, I was taking piano lessons as an experiment at the age of three and a half. I took lessons from Camille Nickerson from Howard University, who was trying to do some pedagogy with some very young children. I stayed with her until I graduated from high school. SP: How did your career progress? CH: I graduated from Howard University with a major in piano. And, my senior year in college, my teacher for singing was Todd Duncan. I needed only one credit to graduate and I took singing. As a result of that semester, he suggested that I continue to study voice. I did, with several of his teachers. When I was getting ready to do graduate work, Mr. Duncan suggested that I consult both the piano and voice department to see if they would accept me as a major. I did and was accepted in both departments, but selected the voice department. SP: Of course, Todd Duncan was a legend, the original Porgy in Gershwin’s Porgy and Bess. What was he like as a person? What was he like to work with? CH: A fascinating person, and wonderful personality. His intellect was so great that you are fascinated from several standpoints; kept you laughing and enticed. SP: While at Howard, you said that you studied piano for four years with Hazel Harrison. I might mention that the Library of Congress has a radio broadcast of a program called “Freedom’s People” (3/15/42), and on it Professor Harrison plays a selection entitled “Will O’ the Wisp.” Would you tell me about your relationship with your former piano teacher? SP: Such a great story. Did you aspire to become a concert pianist? CH: Not really. But I got coaxed into majoring in piano at Howard. I had been playing pretty well. Everyone had been pushing me to become a pianist, but I felt that there were others in the piano department who could play better than I. It sort of took the starch out of me, because I didn’t think that I was a very good pianist. But I had a sister who was a piano major who graduated from Oberlin. I thought that she was much better than me. So I had things that discouraged me. But at the same time, I felt it was what I could do best at that particular point. SP: Did you come from a musical family? CH: My father sang with the Fisk Jubilee Singers along with Roland Hayes from 1907-1911. After that, he, Roland Hayes, and a third male singer (I can’t recall his name), decided that they would form a vocal trio and tour the east coast as a way to finance their continued education. Mr. Hayes wanted to go to Boston and my father wanted to go to New Haven, Connecticut. When my father got to New Haven, he took a little time off from the group and applied to Yale University. He was accepted and also got a job waiting tables in the faculty dining room. So, that is where he received his Master’s degree. He was a singer, and he learned to play a little bit while at Fisk. My first experience with singing occurred when I was about eight years old. Madame Lillian Evanti came to our house because my mother wanted me to sing for her. So, I did. Madame Evanti must have thought that I had a nice little voice. She said, “how nice.” But I thought that my singing was awful. SP: Did your mother also sing? CH: Yes. She was in the Howard University Choir. My father was already teaching there. While a student, she didn’t let too many people know who she was, because she didn’t want to embarrass my father. I distinctly remember her telling me that. CH: Your father eventually became a Presiding Elder in the African Methodist Episcopal Church. When did he have time for his religious work? SP: My father worked twelve hours a day and pastored on weekends. Back then, we lived in the parsonage that was in Georgetown. The church was right across the street from the parsonage. He also ran for the bishopic in the 1930s. SP: Tell me about your career in Germany? Did you go over there because a lot of American singers felt that they had to have European credentials to be accepted as an opera singer? CH: Yes. Another reason was that I needed experience with smaller opera companies. We did not have that kind of set up in this country at that time. SP: You started out as a coloratura soprano, but later your voice changed. CH: Yes. This occurs with age. My voice began to drop. I had a friend who would always say that I had a certain amount of fat in my voice. Well, it was there, and it gave my voice a richer sound. SP: While you were a coloratura soprano, you performed an amazing feat. You sang simultaneous roles of “The Queen of the Night” and “The First Lady” in a German premiere performance of Mozart’s The Magic Flute. First of all, why did you do that and how? CH: Oddly enough, I was cast as "The First Lady.” "The Queen of the Night” became ill during rehearsals. I had a lot of friends in the cast. When we were doing rehearsals, I was playing around vocally with the role of “The Queen of the Night.” Apparently, the news traveled to the Intendent of the theater. The next day, "The Queen of the Night,” who was originally cast for that role, was still ill. So, he said, “Charlotte Holloman, sing 'The Queen of the Night!’” So, I did. Well, he then put me under rehearsal for "The Queen of the Night” as a cover. She did not make the premiere performance. The morning of the dress rehearsal, they said over the loud speaker that I should come to the stage. So, I went to the stage and he said “we would like you to sing 'The Queen of the Night.’ And I said “well, who’s going to sing 'The First Lady?’” And he said “well, you’ll sing that too!” So, I did the premiere performance. I had about sixty seconds to come onto the stage as "The First Lady” and to come back on as "The Queen.” This feat had been unheard of! SP: You have a member of your family on a postage stamp. How did that come about? CH: On January 29, 1993, my uncle by marriage was commemorated as a chemist. His name was Percy Lavon Julian. His discoveries did a lot for life today. SP: You spent several years in Germany. When you left there where did you go? CH: I came back to the United States to teach. I didn’t do any more singing because I was discouraged that I could not stay in Germany. I wanted to stay and didn’t have funds. So, I came back and taught with the idea of going back. But I never went back. SP: Do you still teach? CH: Yes. I started out teaching in New York at Lehman College (CUNY). Then my parents took ill and I came to Washington and continued teaching there. I’ve done adjunct teaching at the University of the District of Columbia, Catholic University, Northern Virginia Community College, and now I teach full time at Howard University. I am still actively teaching, and I carry a rather busy schedule teaching at both the University of the District of Columbia and at Howard. I think I may have gotten my energy from my father. SP: Madame Holloman, thank you for such an inspiring conversation. PROFESSOR WILLIAM BENJAMIN RAY, SR. was a faculty member at the University of Music and Dramatic Arts (Graz, Austria), Professor of Voice at Peabody Conservatory of Music at Johns Hopkins University (Baltimore, Maryland), and Professor of Voice and Head of the Voice Faculty at Howard University’s School of Music (Washington, DC) where he retired in May 2000. He was educated at Oberlin College; the Academy of Music (Vienna, Austria), and Heidelberg University (Heidelberg, Germany). He studied privately with Dr. Daniel Harris and Maestro Sergei Radamsky. 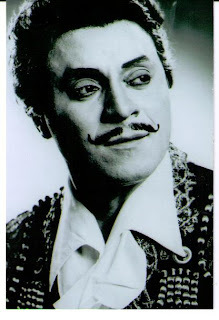 His multi-faceted career in Europe included major opera companies, orchestras, oratorios, and stage and television engagements. In addition, he is the founder of Black Theater Productions of Stuttgart, Germany. SP: Where were you born and what year? WR: I was born in Lexington, Kentucky in 1925. SP: Were you from a musical family? WR: No. Not as far as I know. Family members sang in the local choir, as I did. However, I received lots of encouragement from members of the First Baptist Church in Lexington. SP: Where else did you sing when you were growing up? WR: Anywhere I received an opportunity. SP: Who were some of your influences? WR: There was Joanna Offord, who was a music teacher in the segregated schools in Lexington. She would come to our particular school once a week and lead the children in song. When she found out that I was doing solos, she became my unofficial accompanist. She invited me to her house to learn new repertoire, and correct my mistakes. SP: When did you know that you wanted to become an opera singer? WR: In High School. There was a non African American gentleman from Boston who would come to my house or to Ms. Offord’s house and teach me vocal technique. He was the soloist of a major white church in Lexington. Once, he asked his minister to allow me to be brought to the church to rehearse (so that I my voice could reverberate in the auditorium). The minister refused his request. SP: How did you get started in opera? WR: I finished High School and was drafted in 1943. After I was released from military service in 1945, I immediately enrolled at Kentucky State College to study pre-law (with the idea of later switching over to music). I thought that it would sound acceptable to my parents if I told them that I was studying pre-law since they assumed I would starve to death trying to launch an immediate career in opera. You see, at that time, there were no opportunities for black men to sing opera in this country. At Kentucky State College, there was a woman by the name of Ms. Michaels, whose chorus I sang in at the college. She said to me, “we don’t have enough music for you here. Why don’t you go to Oberlin Conservatory? Carrie Kellog (my wife), William Brown and Sylvia Olden are there.” She continued naming students whom she thought I knew. I said,“ but I don’t have the music background.” She then said, “you’ll get it. Persevere. They’ll give you a scholarship based on your talent.” So, I went, auditioned, and got a scholarship. After a couple of semesters at Kentucky State, I transferred to Oberlin where I graduated from in 1952. SP: How did you end up in Germany? WR: After Oberlin, I went to Cleveland and began working at a social services agency. I also sang in the evenings with a theater company called Karamu. At one of our performances, there was an agent from Vienna in the audience. He came back stage and asked me if I would be interested in coming to Vienna to portray the role of the “Black King” in Menotti’s "Ahmal and the Night Visitors." He said that his company couldn’t pay for my transportation to Vienna, but I would receive a nice honorarium for my work once I got there. I talked it over with Carrie, and went to Vienna alone. During rehearsals there, agents talked to me about other engagements, such as doing a concert tour and singing on the radio with the Vienna Orchestra. Opportunities poured in. I felt confident at that time that I would remain in Europe, so I got in touch with Carrie (who was teaching music in High School in Cleveland) and told her to put our furniture in storage and bring our children to Europe. I had already paid six months on an apartment in Stuttgart, because I was working in that area for the radio and also preparing for an opera career on the side. That was the beginning of my European career that lasted for twenty five years. SP: Tell me about the Black Theater Production Company that you established in Germany. WR: I created the Black Theater Production Company as a teaching tool. During World War 2, troops from many countries arrived in Germany. Many white Americans, some of who were racially prejudiced against Blacks at home, came also. As a result, the white Americans would impart their racial myths about blacks to the Germans, and subsequently, many Germans (though not all) would begin imitating the behaviors that racially prejudiced American whites portrayed against Blacks in America. Because I knew that that was wrong (and ironic) for a Germans, I felt compelled to use the Black Theater Production Company as a way of putting on productions to bring home a lesson: that lesson was that oppressed people (Germans) should be the last to oppress others (Blacks). It was effective, because many Germans were able to reflect on their behaviors as a result of watching the productions that I sponsored. SP: So, in a sense, you used the stage as a pulpit? WR: Exactly. This was in Stuttgart. The actors were amateurs who would often get on stage and read scripts that were given to them. For example. a German actor in one of my productions played the role of a waiter in a restaurant. He went to a table where whites were (a black party was sitting at a table next to the table that he was waiting on), and he’d look at the blacks and frown. The audience sighed as they watched his behavior. SP: Were you the only person doing this kind of work at that time in Germany? WR: I was the only person who founded that kind of organization, but I had a lot of help from Germans and black American volunteers. But the idea was mine and it was based on my experiences. SP: And how long did this company last? SP: What are you doing now that you’re retired? WR: Mainly, I adjudicate for several vocal competitions and teach voice privately. Occasionally, I am invited to educational institution to give talks. SP: Why did you to retire from the concert stage when you did? WR: At some point, when singing, I felt that I was no longer able to produce the sound that I once did. That was my cue to consider retirement from professional singing. There are some folk who should retire (because of a natural deterioration of their voice which comes with age) but they continue. Leontyne Price had the insight to stop. One of her last operatic performances was a televised production of Verdi's "Aida," which was glorious. Her voice was at its top. In addition, she is an actress. Now, she had gotten some criticism for just singing and not acting at times; but not this time.